Made in small (about 100 gallon) stills, they concentrate on small batch and quality. Their current line up includes a nicely flavorful vodka, an extremely flavorful and rich unaged white whiskey a 100% corn unaged white whiskey, and a oak stave aged version of this maple rum , along with a bourbon, a gin and other products in development and to be bottled and released at some future point. Please check here and on their website for new products and updates. Appearance: Clear, sap like appearance, slightly oily on swirling, it clings to the glass nicely, it clings in a light coat quite tenaciously to the glass forming an irregular edge line with some droplets followed by tears and legs. Occasionally I have noticed some “floaters” as they are called in the trade, in this case it is simply some maple sugar crystals which disappear when you shake the bottle gently, it is simply sugar precipitating out. It also proves that this spirit is not filtered to death or uses some sort of stabilizer to make it pretty at the cost of product integrity. Taste: Smooth, somewhat thick consistency/mouth feel entry with a bit of dryness popping up after a bit, notes of maple sugar, wood, slight cinnamon spice, sap or sugar taste but nicely dry unlike a number of maple flavored products that seem to equate sugar/corn syrup to maple. Thankfully this is not the case. Delicious as a dry maple spirit, one of the few we know of. One idea would be to use it instead of a Scotch Whiskey or drier variety of rum. Would be a great addition to a mixologists cabinet, but will require some out of the box thinking, as this is a out of the box type of spirit. 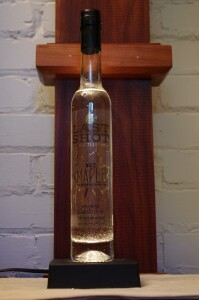 Bottle: Tall thin 375 ML Eau de Vie bottle makes for a nice presentation and shelf presence on your bar.